Hey there! Thanks for joining me for day two of the Papertrey Ink January countdown. I'm back today to bring you more of my new set... Square Prints. From the looks of it, it sounds as if some of you are as excited about these set as I am! I bring you... a one layer masculine card. The border along the two edges was stamped using two images from Square Prints. These two images (along with an additional third image) were styled to fit together perfectly. By simple rotating the corner pieces you could stamp borders of any color or fun flowing patterns. The Papertrey Ink colors I used are enchanted evening, aqua mist, summer sunrise and limeade ice. After stamping the border I layered a couple images from the new (and soon to be available) Destination stamp set, in enchanted evening. Then finished the card off with a sentiment from Embroidered Blooms. Well, that concludes my second look at Square Prints. Just remember... this stamp sets will be available for purchase through Papertrey Ink, beginning January 15th. In the mean time, I'd love to know what you think so far, so please feel free to share! Now, be sure to visit Nichole Heady and Heather Nichols for peeks at Destination and World Map. Also, Dawn McVey and Melissa Bickford have peeks to share with you of their newest sets for the month. wow - they work soooo beautifully! This is looking really cool! Love anything that can make a nice masculine card...! Your card has such clear colors - so pretty. I love your color scheme. I love this card. 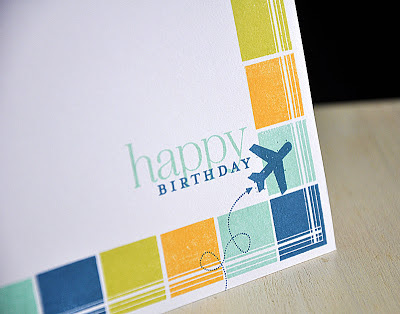 Very clever design for the card and the stamps. Thanks so much. I can't begin to say how much I love the specialized corner stamp. That is perfect. This is a lovely cheery masculine card! Wow, really nice! it looks like an old-fashioned handkerchief or scarf border. I can think of so many uses for these squares. What a handsome masculine card! 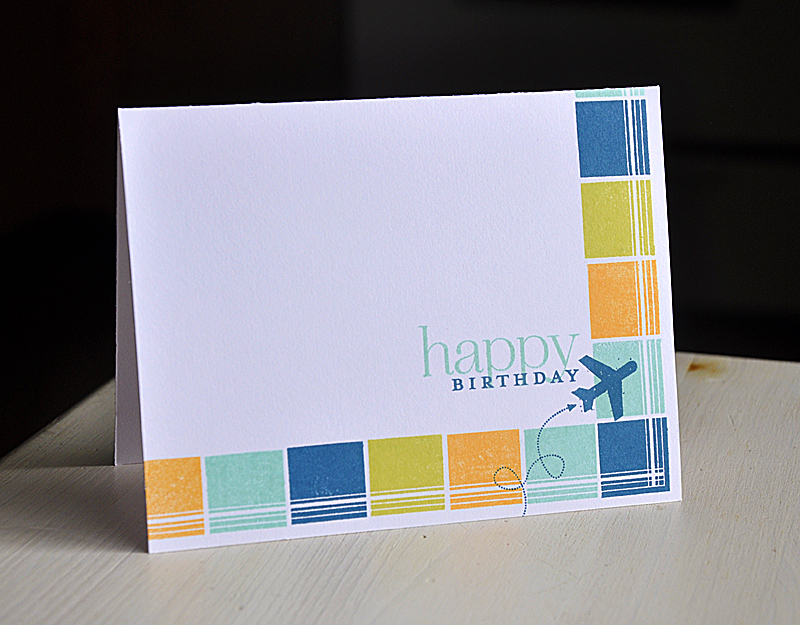 Love this card and the color palette you chose. Love the border you created with your new set! Clean and clever - wonderful cards. Very smart and simple card. I know I am going to love this little stamp set. Love your card. The colors are fantastic. I love this card! The colors are amazing and I love the design! What a great looking modern new set! Thanks for your inspiration! What a great clean and simple card. So many possibilities with set! WOW ~ your card packs a lot of punch with the new Square Prints! You really know how to get us stampers excited, don't you? Love your new stamp set & matching dies! I'm in love with this card. Although how difficult is it to line up those stamps?